Wilmont House, in the grounds of the park, was built in the early 1760s by Scottish farming family the Stewarts, who were among the first to grow carrots on a large scale in the early 19th century. In 1811 an early threshing machine was erected on the property. The last Stewart associated with the house was James, who mortgaged the property to the Northern Banking Company in 1844, ending almost a century of family connections. The estate changed hands several times before James Bristow, a director of the Northern Banking Company, was granted a lease to the property in 1858. He commissioned the building of the present Wilmont House (in 1859), designed by one of Belfast's most important Victorian architects, Thomas Jackson. Bristow's initials are inscribed in stone on the north side of the house. The estate was sold to Robert Reade in 1897 following the deaths of the Bristow male heirs. After he died in 1913, his son sold it to Sir Thomas Dixon for £21,500 in 1919. Dixon was a prosperous Ulster businessman who served as High Sheriff of Antrim and was knighted. Lady Dixon became a Dame Commander of the Order of the British Empire (DBE) for her work for the armed forces during World War I. 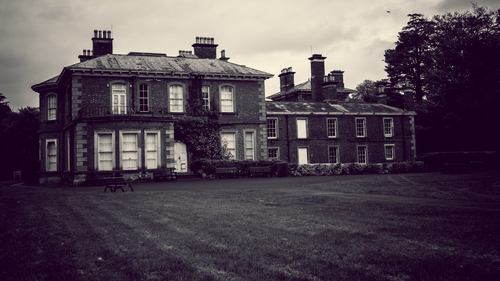 Prince Henry, Duke of Gloucester, was a guest in 1935 and General Collins of the United States Army was billeted at Wilmont House during World War II. Sir Thomas Dixon died in 1950 and in 1959 Wilmont House and the estate was presented to Belfast Corporation “for the greatest good of the citizens of the City of Belfast” by Lady Dixon in memory of her husband. The park opened the same year. From 1963 to 1988 Wilmont House served as a nursing home. Lady Dixon died in 1964, aged 92. The fountain situated in the park was renovated and a new fountain commissioned for the Queen's Golden Jubilee year. The Walled Garden used to provide fruit and vegetables for the house, which has a dummy window, painted on the brickwork to balance the exterior.